I've been looking to move my podfic files elsewhere and this might be a good solution. Thanks for posting it! If you do give it a try, I'd love to know if it works for you. I don't have a lot of datapoints for how much storage/bandwidth is needed for fan art as I just have my own stuff which while popular on youtube doesn't see a lot of downloads on my personal site. Will do, I'll have to poke around at it over my vacation here. I've got about 7.5gb of files that could use a new home. Podfic does have the benefit of being generally smaller file sizes than vids but also most folks stream direct from the source as opposed to doing it via a site like youtube, so I could see it using more bandwidth. THANK YOU so so much for doing this! Will link far and wide! Great guide, thank you so much for laying it out for us! This guide is so handy!! Your explanations are wonderful and easy to understand, and I love that you included screenshots. Will definitely use this service to host my files and might even try to use their cloud backup, too. I am going to submit this to the new vidding newsletter. Here via viddingnews, thanks for a great guide! 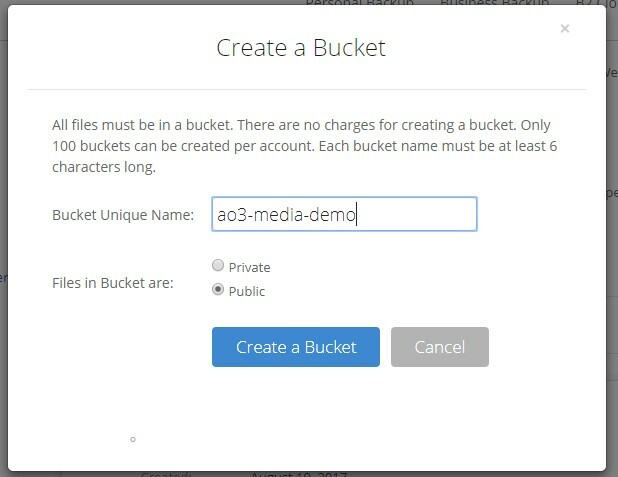 I am looking for a way to allow third parties to upload files to my test BackBlaze bucket. Ideally, we'd allow only authorized users but even a public upload widget would be OK to test. So your server would use that api, get the pre-authorized url then someone could post their file straight to your backblaze bucket without needing their own credentials. Which is to say that even after reading the FAQ and having Python and the B2 Command line installed I tapped out. I think I got myself confused. However, when a video is played I am charged for both the BackBlaze bandwidth and the Bunny CDN (which makes sense since I am using BunnyCDN to redirect to Backblaze). So the error (mine) was not also uploading the mp4 file to Bunny CDN and using it for both storage and playback. I read "use BunnyCDN as an optional add on that works with Backblaze" instead of "use BunnyCDN in place of Backblaze". So bunnyCDN would use some b2 bandwidth but ineally it should only grab the file once, rather than every time, so that should minimize the fees. However, there may be some cache settings that would cause it to re-pull from b2 but I don't know. I went to BunnyCDN and peeked at the Cache Settings (Cache HIT Rate 0%). Since I don't know how Viddercon pull is working with BunnyCDN, I fiddled with one setting. Will check back later. Configure how long our edge servers will store your files before fetching for a new version. If Respect origin Cache-Control headers is enabled, BunnyCDN will follow any Cache-Control or Expire headers returned by your origin server." I changed it from the Default "Respect origin Cache-Control headers is enabled" to "Override 3 months"
This is incredibly helpful and addresses a longstanding issue I've had with hostlinking my podfic. Thanks so much for compiling and sharing this information.